Ehrlich and Simon bet: What terms should we use to gamble on Earth’s future? We’re gambling over Earth’s future. What should the betting terms be? Heavy machinery works at a coal mine on top of Kayford Mountain in West Virginia. 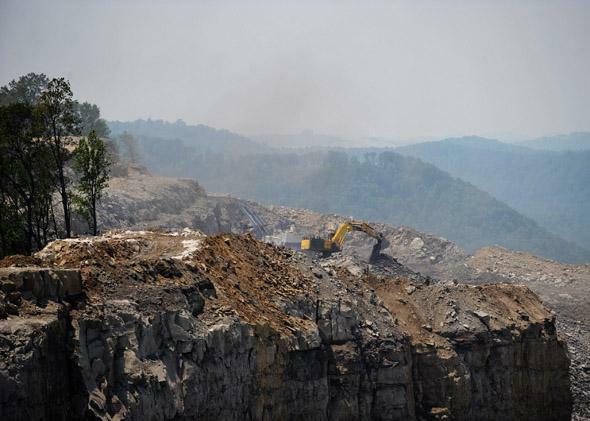 Mountaintop removal mining keeps energy prices down, but endangers ecosystems, so energy prices aren’t necessarily the best measure of progress. In a world in flux, how do we know whether things are getting better or worse for people and for the planet? In a famous 1980 wager, the biologist Paul Ehrlich, author of the 1968 blockbuster The Population Bomb, bet the economist Julian Simon that the prices of five metals—chromium, copper, nickel, tin, and tungsten—would rise over the next decade. Their bet sought to test two competing visions of the future. Ehrlich thought rising prices would prove that an overpopulated world was headed toward disastrous scarcity and famine. Simon thought falling prices would show that human ingenuity would make resources cheaper and more widely available. Simon won their bet. Prices of the metals dropped by about 50 percent from their 1980 to their 1990 levels, even as world population grew by 800 million. Ever since, conservatives have used Simon’s victory over Ehrlich as a cudgel to attack environmental regulation and dismiss fears of climate change. Markets and technological innovation, they argue, promise future prosperity and make government intervention unnecessary. In a follow-up wager, investment banker Matthew Simmons bet journalist John Tierney and Rita Simon (Julian’s widow) that oil prices would more than triple from around $65 per barrel in 2005 to more than $200 per barrel in 2010. The 2010 price averaged just $80. Adjusted for inflation, oil prices had increased less than 10 percent over the five-year period, nowhere close to Simmons’ dire forecast. 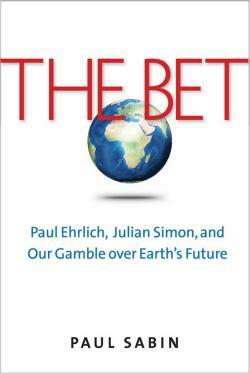 These bets offer important, but also limited, lessons that I examine in my new book, The Bet: Paul Ehrlich, Julian Simon, and Our Gamble Over Earth’s Future. Gloomy forecasts for soaring resource costs reveal an all-too-common tendency to overlook how scarcity and abundance relate to each other. Scarcity, by leading to increased prices, spurs innovation and investment. Efforts to locate new resources and design cheaper methods yield new technologies. New periods of abundance occur, even overabundance or a glut. We see that abundance today in natural gas markets. Yet a bet on resource prices also is a poor measure for environmental well-being or societal welfare. Sometimes resource prices are low because the environment is being degraded or is at risk. Mountaintop removal mining and deep-water oil drilling both produce abundant fossil fuels and help keep energy prices down. But at the same time, they endanger entire ecosystems, from the blasted mountains of Appalachia to the polluted waters of the Gulf of Mexico. More broadly, the price of resources such as coal and oil do not reflect impacts that lie outside the market pricing system. Carbon dioxide pollution, for example, is particularly difficult to ameliorate because there is no price on carbon that might provide incentives for conservation, investment, or alternative energy. If commodity prices are an imperfect metric, what might make for a better bet? In 1995 Ehrlich and Julian Simon tried to agree on a second wager. Ehrlich, along with Stanford climatologist Stephen Schneider, challenged Simon to bet on 15 indicators of material change: concentrations of carbon dioxide, nitrous oxide, and ozone in the atmosphere; global temperatures; tropical forest area; and quantities of harvested fish, rice, and wheat per person. Simon refused, arguing that these proposed indicators affected human welfare only indirectly. Simon instead suggested indicators that directly measured human health and economic well-being, things like life expectancy, leisure time, purchasing power, and commodity prices. Rather than bet on change in a physical entity such as the ozone layer, Simon suggested measuring “the trend in skin cancer death.” The physical world, Simon suggested, could change around us, but progress of human society would continue, bolstered by new technologies, adaptation, and markets. Simon and Ehrlich’s failure to agree on what to measure in a second bet highlighted their very different ways of thinking about environmental problems and societal progress. The gap between their points of view even left the possibility that both could be correct—many environmental changes might occur as Ehrlich predicted, but society could still continue to progress, as Simon argued. Their argument over betting terms raises difficult questions about how we should quantify or test our theories about the future. What measures could show us whether things are getting better or getting worse, for humans and the environment? Put another way, if we were going to make a bet over the next 10 years, what should be the metrics? I asked listeners of the Slate Political Gabfest these questions back in August. In general the suggestions I received illustrated just how difficult it is to compress these big questions into simple terms for a bet. Some of the suggestions would be difficult to aggregate across large areas, such as the cost of water or the productivity of farmland. Other suggestions focused on physical changes in the environment, such as the concentration of carbon dioxide in the atmosphere and the extent of sea level rise. By themselves, these indicators cannot tell us whether societal progress is slipping or advancing, because they say little about the pace of human adaptation. Other ideas, such as the financial cost of storms, fires, or climate change, involve deeply entangled social and environmental issues. These cost-based metrics are problematic because costs have increased in part because people have moved into risky coastal and fire-prone areas, and also have built more expensive properties there. Higher future insurance payments could reflect more powerful and dangerous storms, or they might just signal more expensive and at-risk construction. For me, one of the most compelling proposals was to compare the percentage of disposable income spent on food (or on other essential needs). If people spend less and less (or more and more) of their time earning money to obtain basic sustenance, that could indicate economic progress (or decline). In the United States, this percentage has declined fairly steadily for many decades, but will that trend continue here and abroad? While the effort involved in meeting basic needs is one important measure of progress, widespread concerns today regarding climate change involve risks that are not measured in these statistics. Are human societies prepared for the changes ahead? In 2023 I also would want to know whether we have made progress addressing the future threat of climate change. The symbolic appeal of Ehrlich and Simon’s legendary bet derived from the idea that world commodity prices could clearly determine a winner and a loser. Unfortunately, it’s not that easy. Bets can helpfully focus attention on specific metrics and test theories about the future. But no easily calculated wager can substitute for the bet that really matters—our collective and ongoing gamble over Earth’s future.